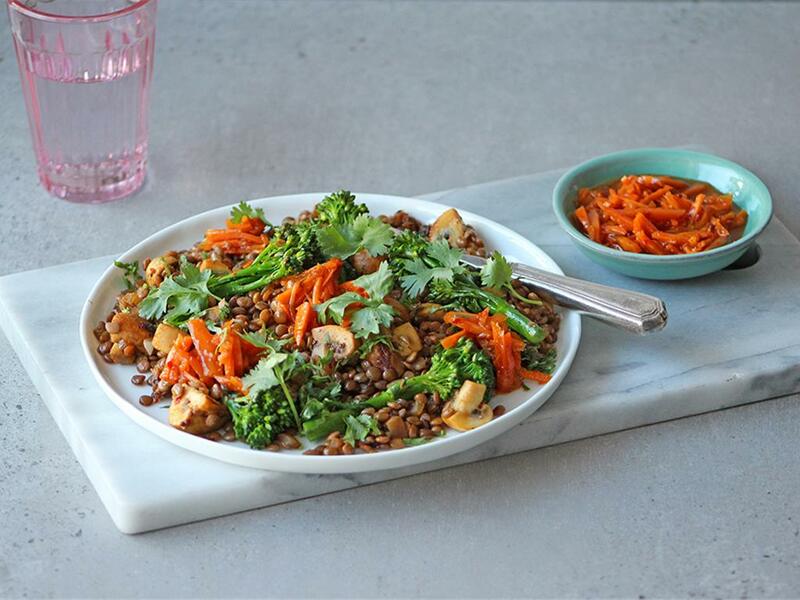 Atchar, cumin & coriander spiced mushrooms & tenderstem, served with lentils & carrot pickle. Black lentils: Place a pot on medium-high heat and add boiling water (3½ cups for 4; 1¾ cups for 2). Add the lentils and boil gently for 15-20 minutes until tender. Drain and season with salt. Masala mix: Place a pan on medium-high heat with a drizzle of olive oil. Add the onion with a pinch of salt and sauté for 3 minutes before adding the mushrooms with the Atchar Masala. Cook for 5-6 minutes until golden, then add the garlic and tenderstem broccoli and cook for another 2 minutes until the tenderstem is bright green and cooked. Add the cumin and dried coriander into the pan with the lentils. Season with salt and pepper, then add the fresh coriander and mix through. Serve topped with the carrot pickle.